There are many free software tools out there. I just want to highlight some of the ones I use to design, implement, and document an electronics project like the PPMScope oscilloscope. FreeMat is an open source mathematical modeling program (read scriptable graphing calculator on steroids) similar to MATLAB or other open source alternatives like Octave or SciLab. I prefer to use FreeMat because it is a lighter than Octave or SciLab. It isn't as full featured as the other two, but it does everything I want it to do. Also, it is more compatible with MATLAB. 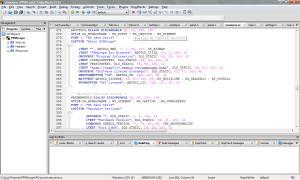 The compatibility is helpful since MATLAB is common in the industry and many scripts are published (Octave and SciLab have MATLAB script conversion tools but FreeMat syntax is compatible out of the box). I have written a collection of FreeMat scripts for my usage, some of which may be useful to the public generally and are available here. FreeMat is supported by a community of users within the FreeMat User Group. And the FreeMat User Guide is available here. 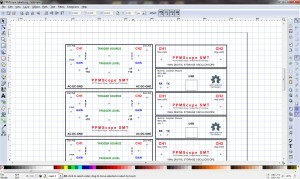 LTSpice is a freeware SPICE program with a schematic editor provided by Linear Technology. I use LTSpice to simulate electrical circuits. I only wish it were open source, but a fully functional free circuit SPICE program is great! Thanks Linear Technology! TinyCAD is an open source schematic capture program. It is useful for drawing schematics for circuits and generating net lists and parts lists. It doesn't include a PCB layout program but it interfaces with PCB layout programs nicely. There are other open source programs like KiCAD or GEDA (Linux) that include PCB layout, but I find the user interface for TinyCAD to be more intuitive. Other than the open source programs listed above, a freeware program called DesignSpark PCB is another alternative. TinyCAD is supported by a community of users within the TinyCAD users group. FreePCB is an open source printed circuit board layout program. I use it because it is light and capable. The user interface is very intuitive, the simplest complete interface I've seen. FreePCB is written and supported by Allan Wright and a user forum on the FreePCB website. There is also a FreePCB Yahoo Group. Thanks for creating a great tool, Allan! Viewmate is a free Gerber viewer from Pentalogix. It is part of a commercial PCB suite of software. Gerber files are used to send printed circuit board designs to PCB manufacturers. PDFCreator is an open source printer driver that generates and saves PDF files. It's great to use to convert documents, images, schematics, PCB's, or pretty much anything to a PDF for documentation. 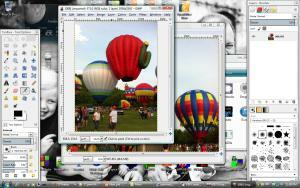 GNU Image Manipulation Program or GIMP is probably the best well know open source image editor for Windows and Linux. It's a very powerful program. I use it to create icons and artwork or just edit picture files. Paint.net is a freeware image editor for Windows. 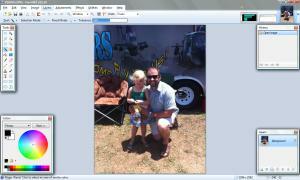 For basic transformations, resizing, and image editing it is simple to use and very intuitive. I find myself preferring Paint.net over GIMP for most tasks, even though the program has less features. But then again, that's the reason I continue to be drawn to it. Inkscape is an open source vector graphics program that is great for making scale mechanical drawings or sketches. I use it to draw artwork for front panels for electronics projects and enclosures. 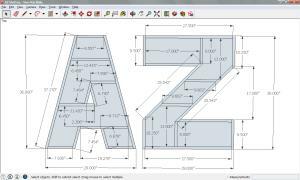 Sketchup is an easy and capable 3D freeware drawing program. I use it for woodworking designs, custom enclosures, envisioning 3D designs, and animations. An open source alternative is MeshLab. I use CodeBlocks as my primary Application Development Environment. 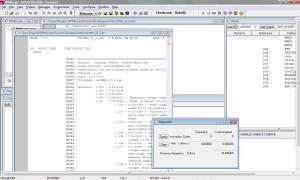 Codeblocks provides an IDE to the mingw C compiler for Windows. It is also open source software. I have also used DevCpp which is a great alternative open source IDE for the mingw C compiler. 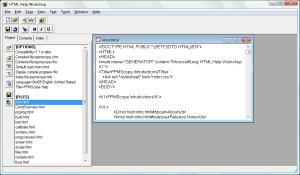 HTML Help is an old freeware tool released by Microsoft for creating compiled help files from HTML pages. It is an easy way to build a help system for a Windows based software program. It has several command line options also that make it possible to generate the help file through a script. This is very useful for packaging a fresh help file and program compile at the same time. I don't do anything fancy when it comes to developing firmware for the PIC Microcontroller. I simply use the Microchip Toolset. The primary tool is MPLAB or MPLABX. I still have a PICKIT2, which I usually use with the PICKIT2 software. OpenOffice is a Windows office document suite similar to Microsoft Office. It is great software, however, I do find Microsoft Office a bit more full featured and easier to use. Nonetheless, the price of OpenOffice is hard to beat and OpenOffice is open source software. I think it is a much better alternative to Office than Google Docs. I use Microsoft Office primarily at work and OpenOffice primarily at home. Though, I also use OpenOffice at work because it is compatible with old Lotus 123 files (and Excel is not). And, yes, we still have some of those hanging around. Notepad++ is the best open source text editor I've seen for Windows. It allows multiple document tabs and multiple views. This is a must since I'm often working across multiple files. There are plugins for spell checking and conversions. Supports adding custom commands to run external applications. As a text editor, it just has the features I need and it just works.